Gov. 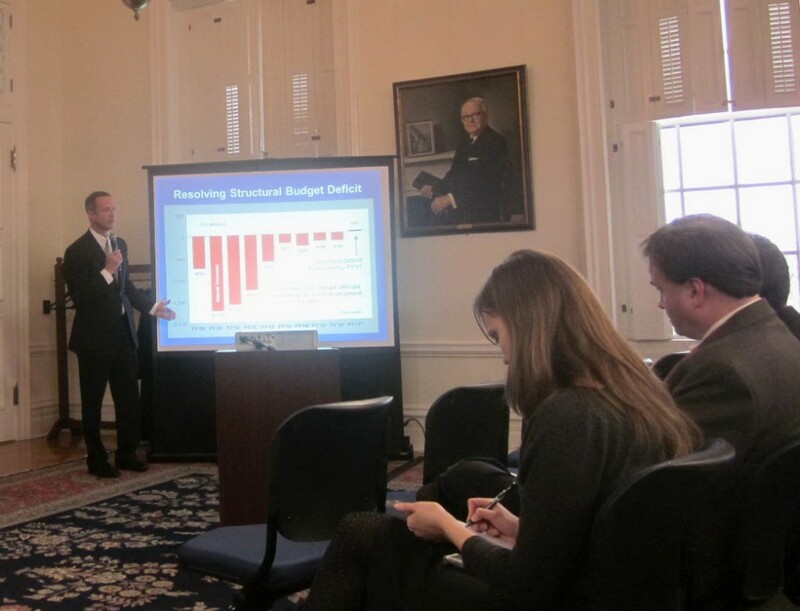 Martin O’Malley explains budget highlight Wednesday. Gov. Martin O’Malley unveiled a $39 billion budget Wednesday that grows spending by 5% with no new taxes or fee increases. O’Malley as usual rolled out the new budget with an elaborate PowerPoint presentation to reporters that put a positive spin on the budget numbers. The budget has record spending on K-12 public schools ($6.1 billion) and health care ($8.9 billion), the largest share of the budget. In terms of the General Fund — the portion of the budget entirely funded by Maryland taxes without federal funds — 48 cents go to education, 25 cents go to health, 11 cents go to public safety (mostly prisons), and 16 cents are spent on the rest of the budget. Here are some highlights that put a different spin on a budget of $39,224,000,000 and some preliminary fact-checking on claims made in the PowerPoint. $9 billion in cuts? Really? If O’Malley has cut $9 billion over the last seven years, how come this proposed budget for fiscal 2015 is almost $10 billion higher than the first budget he proposed for fiscal 2008? 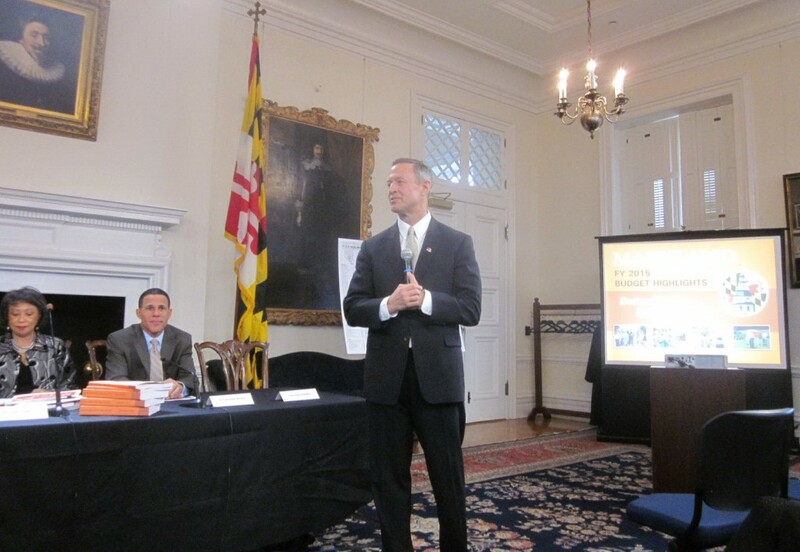 “A lot of these cuts were cuts to spending growth, but a lot of that growth we intended,” O’Malley finally said. O’Malley did make cuts to many programs, and 5,800 positions were eliminated from the executive branch, although most were vacant. The budget largely grew in money sent to the counties for public schools, and to health providers to take care of low income residents. Higher education spending also grew, slowing tuition growth, but state universities now employ over 3,000 more people. 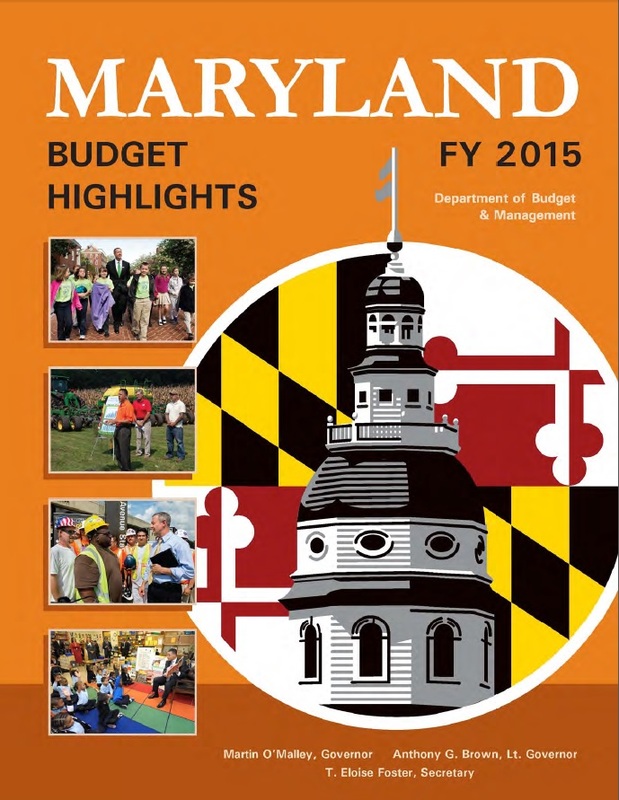 “Eliminating the structural deficit by FY 2017,” O’Malley claims. The structural deficit is the difference between projected revenues and projected spending based on mandated formulas, entitlement programs such as Medicaid, salary increases and higher costs for gas, utilities and the like. The budget can’t be balanced unless mandated spending increases for programs such as education and health care are cut, but these are generally cuts in growth, not cuts in actual spending from year to year. Gov. 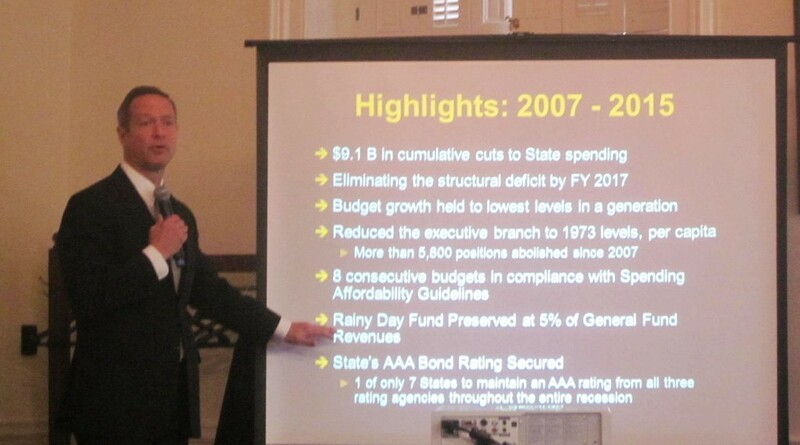 O’Malley shows progress on structural deficit at news conference. This is the last budget O’Malley will submit, so he can’t very well promise anything two years after he leaves office. The Department of Budget and Management will prepare much of next year’s budget for the next governor, but that governor will have the final say. The legislature had thought the structural deficit was close to being cured in this year’s budget. But reduced revenues and unexpected costs dashed those hopes. Before Maryland Reporter asked him about it, O’Malley did not mention that one of the chief ways he balanced this year’s budget and the next was by capping the annual reinvestment of pension reform savings achieved in 2011. When cuts to benefits and increases in employee contributions were passed in 2011, the state agreed to put an additional $300 million a year into the state pension system. That was cut to $200 million this year and now also in the proposed budget, allowing $172 million in “spending reductions” to be used for other programs. Gov. Martin O’Malley was smiling as he presented the last of his eight budgets, with Budget Secretary Eloise Foster and Lt. Gov. Anthony Brown. As a result, the pension fund will take an additional year to reach 80% funding of all the pensions promised, pushing that target from 2024 to 2025. “We believe that is prudent step to take,” O’Malley said. Another $164 million in “spending reductions” was achieved through “favorable trends in employee & retiree health costs,” including more favorable contracts with insurers and better cost containment. The proposed fiscal 2015 budget continues to be balanced by taking money out of “special funds” generated by “dedicated taxes” such as the real estate transfer tax. In next year’s budget, $69 million is being shifted from the transfer tax intended to fund open space and farmland preservation; this money will instead be put into the general fund to pay for other programs. That money will be “backfilled” with bonds. That’s like a family taking money out of a special savings account for college to pay for everyday expenses, then financing tuition with a home equity loan. Over the last five years, O’Malley has floated $1.4 billion in bonds to replace money taken out of special funds. All that money must be repaid over 15 years with interest. This appears to be technically true, but the recommendations of the legislature’s Spending Affordability Committee have been a moving target, applying to different portions of the budget. In most years, the target was a percentage of growth in the budget; the last three years the target was a reduction in the structural deficit. In December, the Spending Affordability Committee recommended 4% growth in the budget as defined by the committee (not the total funds budget) and a reduction in the structural deficit of $125 million. The governor said he met both goals, coming in at 3.73% growth and reducing the structural deficit by $174 million. However, the total funds budget of $39.2 billion, which includes federal funds and special funds, grows by 5%.